A toddler fell in a 60-ft deep borewell in the village of Balsamand, Haryana. Reports said that the toddler was playing with his friends when the incident happened. Rescue operations have started to pull the kid out from the borewell. Rescuers have dropped oxygen tubes for the toddler, they also dropped food for the kid. Heavy types of machinery and ambulances have been deployed to the site. 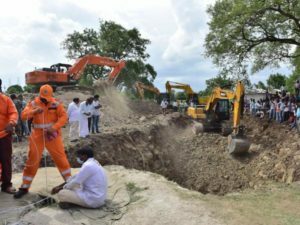 Joginder Singh, The Deputy Superintendent of Hisar Police added that they are currently looking for the person who dug the borewell without getting a permit, he said that the person who dug it will face legal action. Uncovered borewells are traps for toddlers or kids who do not really know what it is. In 2006, 5-year-old Prince fell in a borewell in Kurukshetra, a massive rescue operation was launched to pull him out of the borewell. It took the rescuers around 2 days to pull the 5-year-old out of the borewell.